Have you ever heard of Chiptunes = WIN? If your answer is no, please head over to chiptuneswin.com and download the 51-track Chip music compilation album because it is awesome, and it is "Pay What You Want" - including free, so there is really no reason not to. 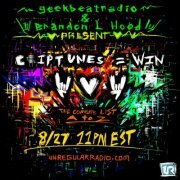 Chiptunes=WIN and Geekbeat Radio are having a marathon listening party to listen to one song from every chip musician on a list of 310 artists (approx.) that is located on the Chiptunes=WIN facebook group this Monday night, right after The World Is Square plays live on the air! Bory and Brandon will be playing a brand new song of mine, and then around noon on Tuesday, they are taking over the Boston Local Music Show, and I'll be playing a set of songs LIVE! So, it should be fun, and you can listen from your cubicle or wherever you have access to the internet by getting the webstream from UNregularradio.com. Or just click on the picture below!